It’s an ongoing joke, to see cops with their favorite snack, doughnuts. But it was the other way around this time. A young girl, Brooke, went into the gas station while her parents were filling up their car with gas. 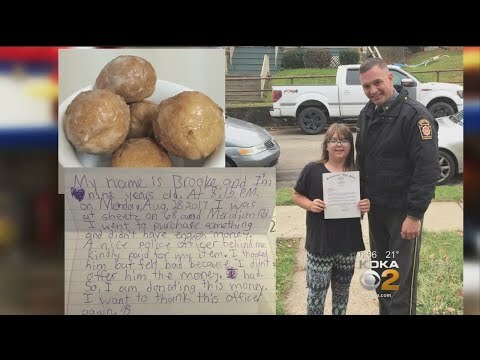 She looked around and found some doughnuts and took it to the cashier. But as the cashier rang up the price, Brooke realized she didn’t have enough to pay for it. Luckily for her, an officer from the Pennsylvania State Police was in the line behind her, and asked the cashier to add the bill to his. The young girl was amazed at what happened, but embarrassed to say anything and ran out with her doughnuts. When she got home, she instantly began writing a letter and posted it to the police station. Inside, she had gathered up all the pocket money she had and put it inside the letter too. One they received the letter, they were all touched by her words, and it triggered something great. A small act of kindness turned big and the state department all came together to buy her a gift card to a toy store for herself. Brooke went and bought $50 worth of toys, but gave it all away to others!